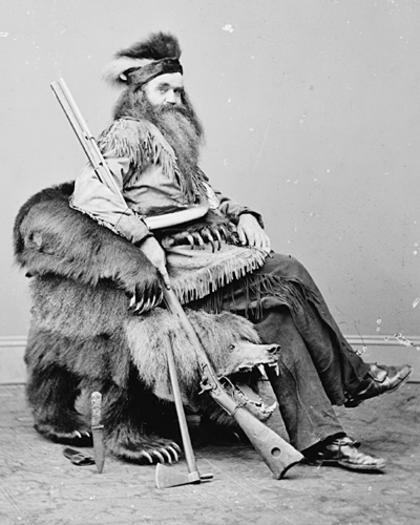 What do you do if you passed a six legged grizzly bear in 1865? You shoot it, make it into a chair, and give it to the president. The photo above in in equal parts bizarre and sad. 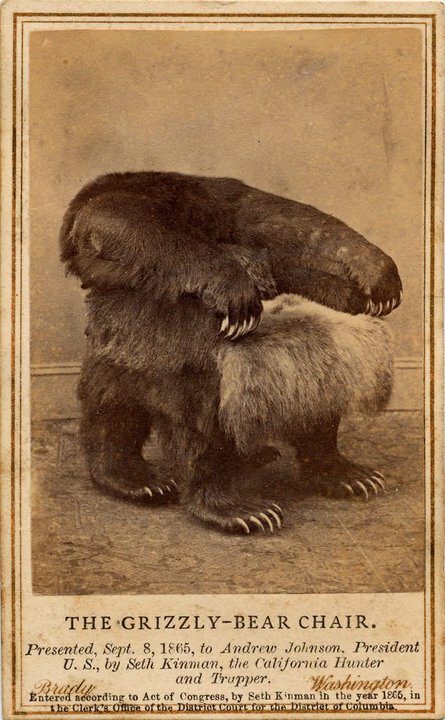 While it wasn’t actually a six legged grizzly, but the components of two different bears, that still doesn’t stop this char from bring completely bizarre, and totally real. It was given to President Andrew Jackson on September 8, 1865 by a hunter by the name of Seth Kinman. That’s Seth above sitting in the chair. He looks everything like what you might expect a professional hunter to look. Apparently he also made a fiddle out of the skull of his favorite mule and gave it to Abraham Lincoln. Weird. And we wonder why so much of our wildlife is on the verge of extinction. Fortunately, this sort of taxidermic decorating has been regulated to the history books, but it’s still really weird to look at. Today, I have a very special piece of furniture for all of you who are looking to remodel your sitting room with a Steampunk flair. Gaze upon the beauty of the Corset Chair by Sarah Louise Dix. This chair has so much personality, and it looks very comfy too! I would love, love, love to own this chair, never mind my tendency for a nomadic lifestyle! It’s so unique and perfectly Steampunk. Unfortunately, its quite pricey, but someone is going to be very lucky indeed to have such a unique and feminine piece in their sitting room. If you are interested, you can click on the photo to view the chair’s Etsy listing. You can also learn more about the artist, Sarah Louise Dix by visiting her website. She has a number of pieces of furniture that are built to look like different pieces of clothing. The Corset Chair is, I think, the best example of her work, and certainly the most likely to appeal to our Steampunk sensibilities.